Blue Devils B took a commanding lead of the Open Class competition during the World Championship Semifinals at Lucas Oil Stadium on Friday, Aug. 7. They pulled further ahead of the second place Santa Clara Vanguard Cadets with a score of 94.35. 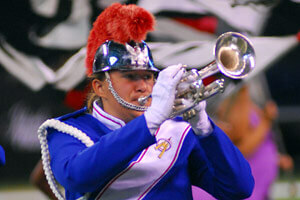 Blue Devils B remains undefeated as the corps advances to the Finals competition tomorrow. 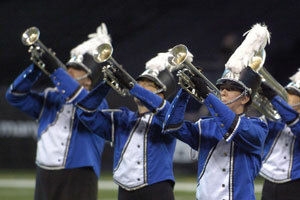 Director Rick Odello said Lucas Oil Stadium was a great venue for the corps' performance Friday. "How could you not have a great show in a house like this? I think we've been working for this all year. You take those steps up the ladder to have this kind of performance," he said. "They're excited about being here. They're having fun. I think they were really satisfied with the level of their performance today." Santa Clara Vanguard Cadets earned a score of 92.75. 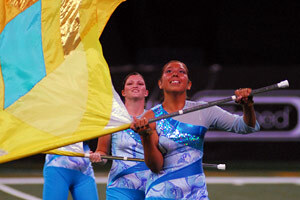 While topping the Blue Devils in the color guard caption, the corps remained in second place 1.60 points behind their West Coast counterpart. Vanguard Director Robert Ripley said his corps, like most other Open Class corps, didn't have the same opportunities bigger corps have to perform in domed stadiums before the World Championships, so the members were anxious to see what it would be like in the new environment. "I think there was a lot of excitement coming into it," he said. "It was a great show, the kids were really ready. They were anticipating what to expect with the new venue." Citations took third place with a score of 90.90. 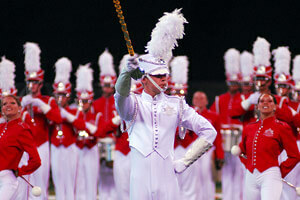 The corps tied for the top spot in the visual caption with the Blue Devils and won color guard. Drum line member Stephen 'Cubby' Murphy said the corps had a great performance on Friday and hopes to finish in the top three this year. It would be the first time the Citations have medaled in the history of the corps. Murphy said in the final hours of rehearsal left in the 2009 season, "we're going to be getting rid of the inconsistencies and ironing out the wrinkle spots in our show. We all know the information, we all know the show. It's just the little things now that we need to focus on. This year now, we're really cooking." Fourth place went to Teal Sound (89.85), with Capital Regiment (5th, 88.95) less than a point behind. The Oregon Crusaders jumped into 6th place with their score of 87.15, with Revolution (7th, 87.05) hot on their heels. Raiders took 8th place with an 86.80, while the Velvet Knights earned an 83.20 good for 9th place. Less than a tenth of a point separated Legends (10th, 82.25) from Memphis Sound (11th, 82.15). Memphis Sound front ensemble member Jeanne Clark said she has had an amazing summer. "This season started off great and it's still getting better. This has been the best experience ever," said the first-year age-out member. "The members here … We're basically just a humongous family. We all know how to deal with everyone else, on our bad days and on our good days. We pump each other up." Clark said getting to the World Championship Finals in her last year is incredible. "I'm really glad I got to do it. I'm really proud of our whole front ensemble. We've grown so much musically, we have all learned so much." Newcomers to the later rounds of World Championship competition abounded on Friday. One such corps was 7th Regiment, which will be heading to the Finals competition Saturday for the first time in the history of the corps after securing 12th place with a score of 80.85. "It's a momentous occasion for us," director Tim Rall said. "We stared six years ago, and we've been gradually improving year after year. We have a great staff and great kids, and they deserve this. We were really excited about making the Semifinals last year and our goal was to make Finals this year." 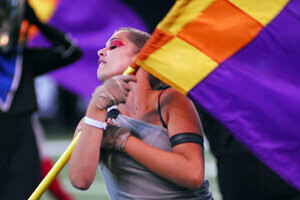 Fifth-year member and color guard captain Rachel Timmons said 2009 was the best season the corps has had. "We have so many great kids who want what they are fighting for. It's good to be a part of something where we're building from the ground up. Five years ago, we were nowhere near being contenders for Finals like we are now," she said while expectantly waiting for the corps' score after performing. Music City members, in their first year competing on the DCI Tour, just missed the cut of corps that will advance to the Finals competition. They earned 13th place with a score of 80.40. "It's my first year marching with a drum corps and I thought this would be an awesome opportunity for a new thing. I have been very proud to be a part of the very first season of Music City," said Katie Breidert, who is a member of the front ensemble. "We finished the season with 47 of the greatest individuals I have ever seen and I will never forget this summer. We have done what we set out to achieve, which is to show people that you can start something new and finish strong." Breidert said she couldn't stop smiling while she performed her last show for the year. "It was just amazing. It was the most magical thing I've ever been a part of, and I can't wait to do it again. Fourteenth place went to the Colt Cadets, who earned a 78.10. Chris Deligiannis, a second-year member of the corps, said the season was long and hit some bumps, but the final few weeks were remarkable. "The last couple of weeks, we've been really pushing and we really brought it to the field today. The feeling I have right now is indescribable. It's such a feeling of accomplishment and teamwork," he said. "I learned how to work together with people to make changes really quickly, to listen and be attentive and follow every direction." 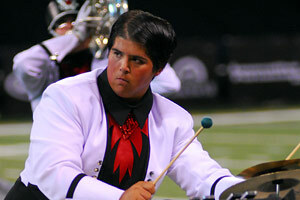 The tenor drummer said marching in Lucas Oil Stadium was a cool experience. "I felt like Payton Manning. I was thinking about throwing a touchdown pass in the middle of the show," he said with a smile. "The sound echoed like crazy. It was monstrous. It was amazing." Deligiannis says he will tell his friends at home that he spent the summer doing his two favorite things; hanging out with friends and drumming. "I had the greatest time of my life," he said. A score of 76.40 earned Dutch Boy a 15th place finish on Friday for their performance of "Bizarro." Snare drummer Kris Topherrolls said the corps' performance on Friday was definitely the best of the season, and having that performance in Lucas Oil Stadium was an exciting way to end the season. "This season has been a huge growing experience," he said. "I was section leader this summer, so it was a great experience for me to grow, leading a group of guys day in and day out." The Racine Scouts earned 16th place and a 72.70 in their first ever Semifinals appearance. "I'm happy where we ended up," said second-year Racine Scouts mellophone player Jay Gastro. "It's the first time since this corps joined Drum Corps International that we made it into the Semifinals, so we kind of made a little bit of history here. That's pretty neat." Gastro said the corps had a rough start but success came their way at the end of the season. "When times got the hardest, we were able to knit together and pull off some of the best shows that we've had," he said. "Being in this new stadium was pretty exhilarating in itself," Gastro added. "We had a really good run and I'm definitely looking forward to next season and seeing where we can go from there." Les Stentors took 17th place, earning a score of 65.90. Director François Bernier said the season was difficult at times because they were often unsure if they would have enough people to be able to compete. "I'm very excited and proud of what they did all summer long, all they've learned and how they've pushed themselves," he said.